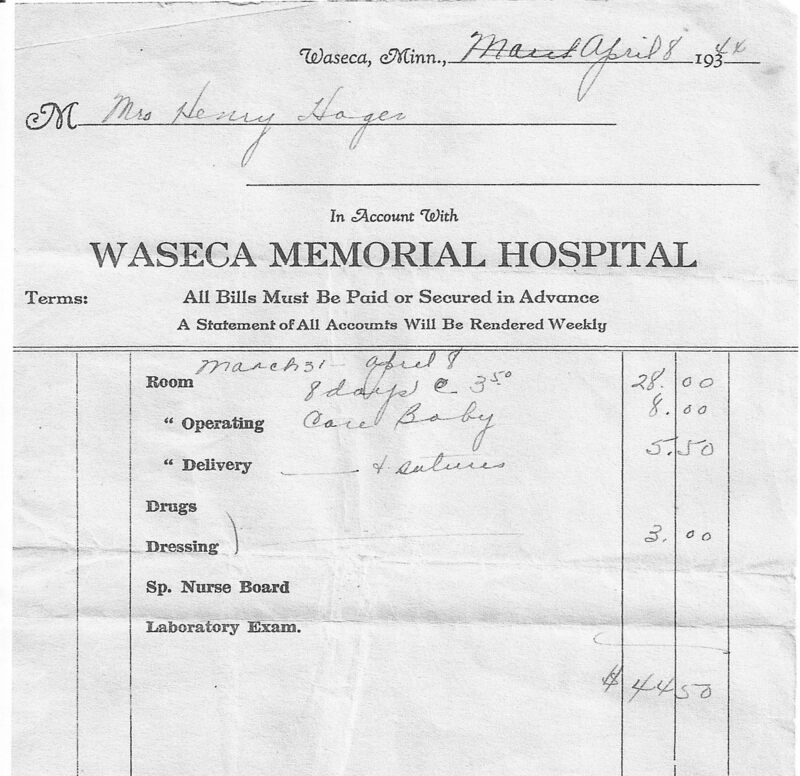 This is the hospital bill presented to my Grandma Hager after my dad’s birth. The charges are laughable, are they not? And, eight days in the hospital? As far as I know, the birth was routine. Grandma had 11 other children at home so who knows–maybe she asked to stay a few extra days! What strikes you most about this bill? Three dollars and 50 cents a day?? And eight days?? Wow. Now it’s thousands of dollars, and women are booted out! Yes, I wish things were more simple, too, and a lot less expensive. I know an executive at an insurance company, and he and his wife are building a second home for over half a million dollars. Their SECOND home. UGH. Sadly, that does not surprise me. Who really suffers with the insurance rules and regulations? I despise how complicated it all gets. There are so many choices and it’s hard to know if you’re doing the smart thing. The hospital must have either overstocked their inventory of receipts, or they didn’t issue many, because the pre-printed year is 193___, when this was written in 1944! I can only imagine that Grandpa and Grandma probably had to borrow some, or all, of the money just to pay this. $44.50 is a pittance now, but back then it probably broke the bank. But, Paul A. Hager certainly was worth every penny! I noticed the date at the top, too. It makes me wonder why they were still using that stack of forms! I guess it was the day in which you used everything–no need to throw it away just because the date is wrong. Cross it out and start over! I love the fact that women were given personalized rest after giving birth…Your Grandmother was provided a well deserved rest and a chance to bond with her new baby before returning to the demands of the fold. Good point about bonding with the baby. I’m sure those few days were really valuable. Now new mothers are rushed out of the hospital, which I’m sure can be stressful. If only healthcare was so inexpensive today. Don’t get me going on the costs of healthcare and health insurance premiums. My premiums are increasing $100/month to $561/month and that’s with a $3,000 deductible. i’m just so frustrated with how much my family forks out for coverage. And, yes, I need to wade through new options, which I’ve avoided due to the mess and uncertainties with the healthcare reform offerings. It was April. I guess the nurse was maybe in a hurry! I totally agree about health care costs. I wish it was as simple as it was in 1944. Each hospital sets its own price and bills directly. That wasn’t that long ago. I wonder when things started to change.